Savvy Rest offers a variety of customizable and formed organic pillows. Dominick and Sheena describe each of our seven organic pillow styles. Dominick: Hi, my name is Dominick. Sheena: And I'm Sheena. Today we're going to talk about all the organic pillows that Savvy Rest has to offer. D: Now we know everyone has their own definition as to what's comfortable. Some people prefer a very soft, fluffy pillow while others want something that's on the firmer side. S: Today, we're going to walk you through all of our pillows so by the end of this video you'll know which pillow if right for you. D: Let's start with our customizable pillows. Our customizable pillows are made with organic natural latex, organic wool, or organic kapok fill. These pillows are very convenient because you are able to adjust the height of the pillow by unzipping the two organic cotton covers and removing the desired amount of fill. now be sure to hang on to that fill in case you want to add it back to the pillow later. We intentionally overstuff our pillows so that you have plenty of fill to work with. S: Organic kapok is our most popular pillow fill. Kapok is a wonderful, plant-based alternative to down. And it's soft and cozy. If you're looking for a luxurious fluffy pillow, then I would highly recommend kapok. D: Another one of our customizable pillows is our shredded latex pillow. Our shredded latex is made of both organic Dunlop and Talalay latex. What's great about this pillow is that it conforms to your neck and shoulders, giving you great support throughout the night. S: We have two other customizable options: wool and a wool-shredded latex blend. Wool is an amazing natural fiber because it helps to stabilize your temperature if you sleep hot. The wool-latex pillow is a little less dense in feel compared to the wool pillow. The wool pillow is a bit on the firmer side. D: The rest of our selection is made up of natural latex formed pillows. The first pillow we're going to talk about is our natural Talalay formed pillow. It's medium-firm and comes with an organic cotton knit cover. This is a very responsive pillow, but it's also going to provide excellent support. And here we have our soap-shape pillow. This low-profile pillow is made with soft organic Dunlop latex. S: Finally, we have our organic contour pillow. This pillow is made with medium Dunlop latex and it's the firmest pillow that we have. Contour pillows serve a very specific purpose and are mainly for side sleepers who require extra support for their neck. D: Of course, the best way to test a pillow is to visit one of our dealers across the United States or Canada or one of our own Savvy Rest Natural Bedroom stores. I hope this video has been helpful, but there's nothing like trying out the pillows in person. To find your closest dealer, please visit our website at savvyrest.com. S: Thank you for watching and sweet dreams. Choose from a variety of customizable and formed organic pillows. 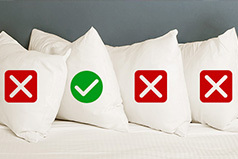 Pillow preferences are personal; there’s no one-size-fits-all. This summary will help cut through the confusion.